The height of the Ganesa is 11ft, the biggest in the history of Eastern Chalukyan Sculpture attracting hundreds and thousands of devotees day by day, a tourist spot, with green fields. Bhadrachalam temple is one of the most important temples of Lord Rama in the country. It has a rich history and is a major pilgrimage center of south India. Hundreds of thousands visit the temple each year to catch a glimpse of the Lord. Srisailam was famous in the 4th century A.D, according to Nasik inscription in this inscription mountain was divided into 3 parts. One of them was sirithan. Later it was called as Nallamala. Nasik inscription was carved by pulomavi belongs to satavahana dynasty. Maisigandi maisamma temple Kadthal is located in Amangal mandal, Maisigandi Village . Maisigandi is a small village in the Srisailam Hyderabad highway. The temple of Maisamma (local name for Goddess Mahakali) comes before Maisigandi village. It is a robust developing temple of Mahakaali, it is also a must see temple, resembles the cultural and mythological feelings of local Banjara people. Thiruvanaikoil temple is one of the Panchabhoota Stalams (signifying the 5 natural elements) and represents water ('Neer'). The other four temples are Kalahasti for wind ('Kaatru'), Tiruvannamalai for fire ('Neruppu'), Kanchipuram for earth ('Mann', 'Bhoomi') and Chidambaram for space (?Aagayam?). As this temple represents water this is also called as 'Appu sthalam' and the Shivalinga ('Swami') here is called as 'Appu Linga'. Even today you can see water oozing out near the Shivalinga idol in the temple. The goddess of this temple is 'Akilandeswari' ('Amman'). The Amman is also called as Akilandanyaki. Akilandeswari is pronounced as 'Akilam - Aanda ? Eswari' (Akilam ? Universe, Aanda ? Ruler, Eswari ? Goddess). 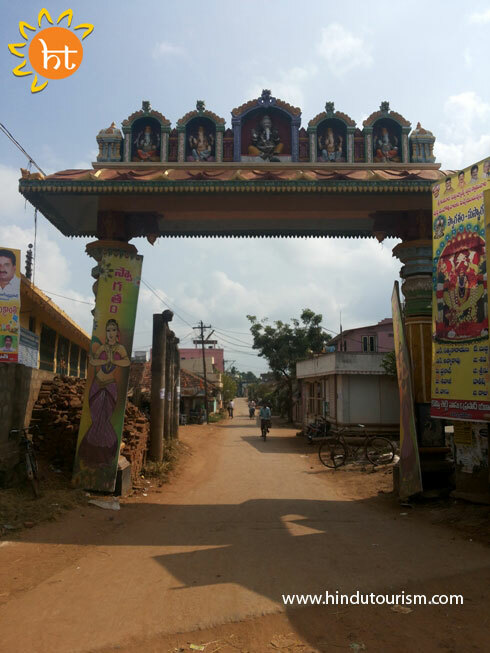 Mopidevi, around 40 minutes of journey from Machilipatnam is a famous temple village with Subramanya Swamy temple in the center of it. Many devotees visit the temple all through the year, especially for Annadaanam and First Cut for children. Here is some glimpse of the sacrosanct. Goddess Kanaka Durga self-manifested(Swayambhu)on a hillock known as Indrakeeladri on the left bank of the river Krishna at Vijayawada in Andhra Pradesh in South India. The shrine also called Sri Durga Malleswara Swami Temple dates back to the 8th century. The temple is said to have been constructed during the rule of Mogalaya ruler Thanisha. According to the Sthalapuranam,Thanisha with the assistance of his ministers Akkanna and Madanna managed the temple from Kondapalli. The Bhadrakali temple is an ancient temple, located between Hanumakonda and Warangal, dedicated to Goddess Bhadrakali. The Goddess is known as the 'Supreme Mother Goddess'. The temple has a rich cultural history and is built in the Chalukyan style of architecture. The Ravana Ella Cave is located on a cliff close to Ella, 4490ft above sea level and can be visited on a day trip from the villages of Ella or Bandarawela. This cave is part of a tunnel or network of caves said to be connected to the Ravana Ella Waterfall which is more popular with tourists. In the Hindu legend of the Ramayana, it is said that the Demon King of Sri Lanka Ravana lived here for some years. He abducted Princess Sita, wife of the Indian Lord Rama and kept her trapped here before confining her to the garden of Ashoka Vatika, also close to Ella. The Shri Mahalakshmi Temple of Kolhapur in Maharashtra, India, is one of the Shakti Peethas listed in various puranas of Hinduism. According to these writings, a Shakti Peetha is a place associated with Shakti, the goddess of power.